Earlier this morning at approximately 1:20, the Calcasieu Parish Sheriff’s Office responded to a call regarding a man shooting outside of a bar on Highway 90 in Sulphur. 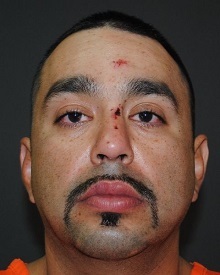 The initial investigation revealed Carlos A. Soria, 30, 1122 W. Verdine St. # 63, Sulphur, was kicked out by security after fighting with other bar patrons and threatening security with a knife. Soria left and then returned a short time later, drove his car to the front of the bar, and attempted to walk to the door with an AK-47. Soria fired the gun several times and attempted to enter the bar. He was tackled by security and bar personnel, and they were able to apprehend Soria and take his gun from him. When deputies arrived on scene Soria was taken into custody without incident. Soria was arrested and transferred to a local hospital due to him being severely intoxicated and complaining of injuries. After being treated by hospital personnel he was transported and booked into the Calcasieu Correctional Center and charged with aggravated assault; aggravated assault with a firearm; terrorizing; illegal use of a weapon; and possession of a firearm on premises of alcoholic beverage outlet. His bond is still pending. No one was hit by the rounds during the incident.